Nineteen-year-old Gammaya has had pain in her right leg since she was three. She suffers from a bone infection called Osteomyelitis, which has seen the pain increase throughout her life. Treatment at various hospitals had brought Gammaya no relief and her family were unable to afford the necessary surgery so she eventually returned to her village. When INF began working in Gorkha after the 2015 earthquake Gammaya told staff she wished she were dead rather than put up with the chronic pain any longer. Staff assessed Gammaya and she was sent to Green Pastures Hospital in Pokhara. 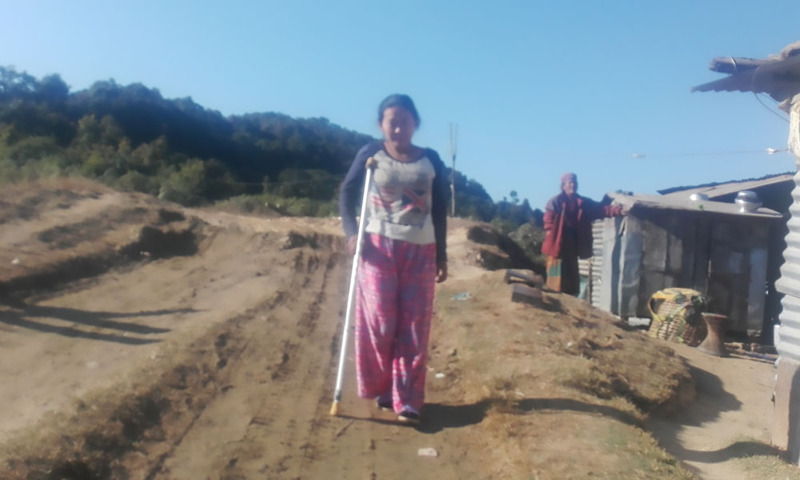 She had surgery at the hospital and returned to her village three weeks later with crutches. After doing regular exercises and making follow up visits to the hospital she was able to walk using one crutch within a month. Today, Gammaya walks independently without pain and is able to help with housework in the family home. She has also begun training as a social worker and is keen to help others with similar conditions to hers. She is thankful to INF for giving her a reason to live again. You’ll also find this article in our July edition of Today in Nepal.